The condition of 20-year-old Shira Klein, who was seriously injured in a car attack in Jerusalem, has improved. The condition of 20-year-old Shira Klein, who was seriously injured in the terror attack in Jerusalem in which Shalom Yohai Sherki was killed, has improved. The Hadassah Ein Kerem Hospital said on Saturday evening that Klein is conscious, breathing on her own and talking with her family. Klein and Sherki were the victim of a Palestinian Arab driver who deliberately rammed his car into a bus stop in the French Hill neighborhood. 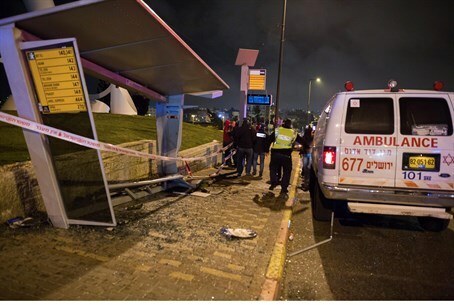 The attack was originally ruled an “accident” before police confirmed it was indeed a terror attack, with evidence from the scene including the way the car struck the bus stop where the two were waiting strengthening that assessment. Sherki, who was critically injured and taken to hospital where he later died, was recognized this past week as a victim of terror by the State of Israel. The terrorist's pregnant wife claimed in interviews with Palestinian Arab media that her husband is not at all interested in politics and news, so the incident was not a terror attack but "a car accident caused by the weather." Kutina, however, has admitted that he had specifically planned to kill Jews in retaliation for his "miserable life."